Nancy Alfaro graduated with a BS in Biology from the University of California, Los Angeles. She has a variety of interests, including helping to increase access to legal, medical, and educational resources in disadvantaged communities. Ms. Alfaro is a Staff Research Assistant for the CPPRN (Community and Patient Partnered Research Network) Demonstration Project, which addresses mental health disparities prevalent in ethnic, sexual and/or socioeconomic minority populations by involving the community in the solution. Concurrently, she provides administrative assistance to Dr. Jeanne Miranda. 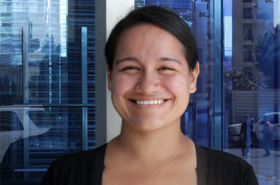 Recent personal experience has motivated her interest in providing free legal counsel to disadvantaged communities. She hopes to attend law school in the next few years and eventually start a non-profit law firm that caters to marginalized individuals: ethnic, socioeconomic, and/or sexual minorities, and even students. In particular, she would like to specialize in Landlord-Tenant Law and Immigration Law. Ms. Alfaro would like to develop studies that take a similar community-centered approach in addressing disparities in legal resources and number of marginalized individuals who seek legal counsel. The Community and Patient Partnered Research Network (CPPRN) is a new program in Los Angeles County and New Orleans. The program will collaborate with under-resourced communities to improve behavioral health services. The program will use community-partnered participatory research (CPPR) to engage patients and community stakeholders in co-leading all aspects of our research. CPPR emphasizes transparency, respect, co-ownership, and capacity development to increase your trust in our research. These principles assure that we study questions and outcomes for behavioral health that are most important to patients, caregivers, families, and communities.